Male neonate was born by normal vaginal delivery at 38 weeks. He was antenatally diagnosed to have dextrocardia, congenitally corrected transposition of great arteries, moderate ventricular septal defect and pulmonary atresia. He was born in good condition and cried at birth. However, he was noted to have saturation of 65%–70% in air and started on continuous positive airway pressure and transferred to neonatal intensive care unit for further monitoring. Postnatal echocardiography confirmed the diagnosis, and he was started on prostaglandin E1 (PGE1) at 5 nanogram/kg/min. On day 3 of life, he underwent a cardiac gated CT angiography (CTA) for further understanding of anatomy and confirmation of diagnosis. In view of need for PGE1 until transfer to tertiary cardiac surgical centre, a peripherally inserted central venous catheter was inserted in the following 12 hours. 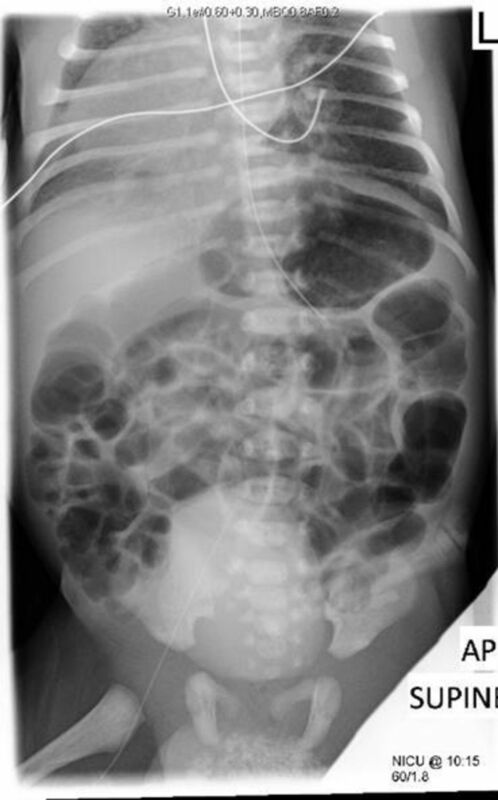 He underwent an abdominal X-ray to check long line position (figure 1). Homogenous dense shadow within urinary bladder. 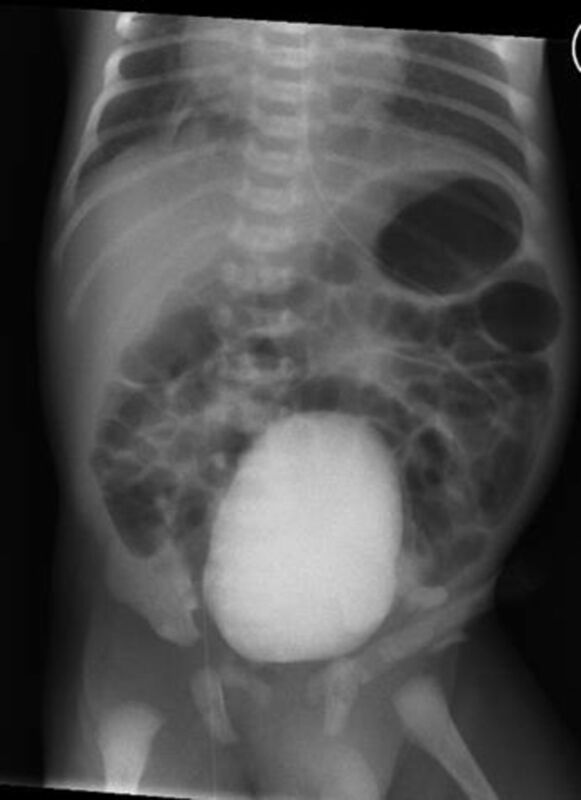 Abdominal X-ray showed a homogenous opacity within the urinary bladder due to retention of contrast. Long line was visualised to the right. The homogenous opacity was an incidental finding when X-ray was done to confirm the long line position. Unless patients are well hydrated before the procedure, there is a likelihood of acute renal failure especially in infants and in the paediatric population. Osmotic action of the contrast further potentiates dehydration due to diuresis.1 Our patient was on maintenance intravenous fluids, and the X-ray repeated 6 hours after the previous showed further excretion of the contrast from the bladder (figure 2). Normal X-ray of abdomen 6 hours later. It is well-known fact that iodinated, non-ionic, water-soluble contrast agents are excreted by the kidneys. Contrast media-induced nephropathy has been noted in children with normal renal function. The documentation of a homogenous opacity within the urinary bladder was an incidental finding as an abdominal X-ray was done to confirm the long line tip position. We would like to highlight the need for monitoring evidence of dehydration and renal function before the administration of contrast agents to the paediatric population.1 4 Our patient’s urea and creatinine preprocedure was 1.1 mmol/L and 64 µmol/L. Postprocedure urea remained the same, and creatinine was 63 µmol/L. Urine output remained between 2 mL/kg/h and 3 mL/kg/h. Iodinated, non-ionic, water-soluble contrast agents are excreted by the kidneys. Babies should be adequately hydrated and their renal function should be checked before they are injected with contrast agents prior to any procedure. We acknowledge the parents of this baby who gave consent for the images to be published. Contributors Both authors have been involved in conception and design of the article, data interpretation and writing the draft. The final draft has been approved by both authors. Both authors have been involved in patient care.